Bitcoin Has Split Into Two Cryptocurrencies. What, Exactly, Does That Mean? 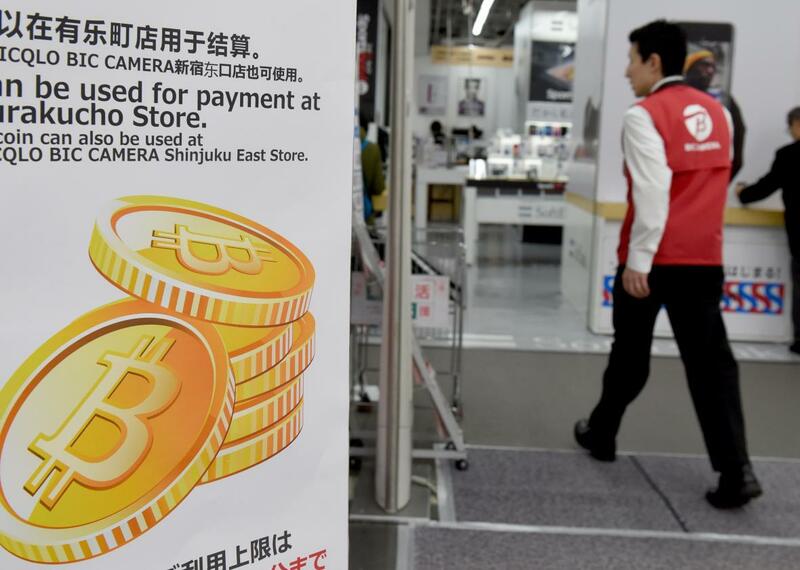 This picture taken on April 7, 2017, shows a man walking past a signboard informing customers that bitcoin can be used for payment at a store in Tokyo. If you owned bitcoin prior to Aug. 1 and slept in a little that morning, you would have woken up to find your stash had doubled—sort of. Before Aug. 1, there was a single bitcoin currency simply called bitcoin, or BTC. Like most cryptocurrencies, bitcoin avoided having a central bank that verified transactions by maintaining a constantly verified ledger of transactions that was distributed across thousands of computers. This ledger is called the blockchain, and up until Aug. 1, there was only one of it. That day, at 8 a.m. Eastern, an “alternative coin” called Bitcoin Cash, or BCC, was born when the bitcoin blockchain split in two. Bitcoin Core, as the original currency is now called, and Bitcoin Cash have identical ledgers until Aug. 1. Now each currency maintains a separate ledger, and since cryptocurrencies are represented by their blockchains, that means bitcoin has effectively split in half, giving each user a bank account filled with both currencies. If transaction time were the only issue, though, there wouldn’t be a three-year-long flame war and a battling subreddits, one for each coin. There are two other issues. One is that the BTH folks think that allowing larger blocks hinders small players from “mining” bitcoins, centralizing power in the hands of large mining entities. Bitcoin was created as an alternative to centralized currencies, however, so “greater centralization” is a serious accusation. Point for BTC. BTC has proposed a size increase of its own, one that comes with an even greater philosophical change. Segregated Witness, also known as SegWit2x, aims to fit more transactions on one page of the blockchain ledger by doubling the size of the page (that is, doubling the blocksize limit), and by reserving all space on the page for transactions. Right now, each page (each block) contains transaction details (Alice gave Bob 2 BTC), and signatures (I, Alice, agree to give Bob these 2 BTC). Instead of making the page much longer, SegWit2x wants to create more space on the page by erasing the signatures and reserving that space for transactions. Many believe this proposal changes the fundamentals of bitcoin more than BCC does, and in terms of structure of the chain, they are right. That’s why some supporters of BCC oppose the name “alternative coin,” they view what they’re doing as closer to Satoshi’s vision than BTC. Point for BCC. However, the Highlander “there can be only one” approach is a false choice. To understand why, we need to look at the recent history of another cryptocurrency, Ethereum. Back in June 2016, $50 million were siphoned away from the “Ethereum blockchain” by some clever thieves. However, the thieves weren’t quite as clever as they thought. Because of the way they drained the money, they had to wait 28 days before they could withdraw it and, presumably, retire to some tropical locale. In that time, Ethereum made a hard choice, one that Gavin Wood, co-founder of Ethereum, called “the single most important moment in cryptocurrency history since the birth of Bitcoin.” Rather than let the thieves make away with the money, a large portion of Ethereum users forked the blockchain so that the transactions that stole the ETH never happened. A lot of people were upset by this. It violated the “spirit” of the blockchain. The purists split off and started their own cryptocurrency called Ethereum Classic (ETC). A year later, both currencies are still used (though ETH is worth far more than ETC) and are fairly stable. In fact, their combined value is greater than the original value. The same thing seems to be happening with bitcoin. According to Quartz, BCC is already the third most valuable cryptocurrency, behind BTC and ETH. And, just like the Ethereum split, the BTC-BCC market is worth more than the original market was. However, while there can be more than one currency, that’s not to say there will be. It took six hours for the first BCC block to be mined, a process which usually takes about 10 minutes on BTC. That block was 1.9 MB, larger that BTC would allow, but the next block on BCC was only .04 MB, stoking fear that not enough miners had adopted BCC. Whether the achievement of BCC’s debut as a new cryptocurrency is a Pyrrhic victory for the founders or a resounding success will hinge on the answer to that question.